Some of you that have been following us may know that Stacey and I belong to a Note investing Mastermind Group. This Mastermind Group is lead by Scott Carson and is made up of serious note investors who have gone through Scott’s personal training programs to learn to evaluate, market and buy non-performing notes. We meet about 3 times a year along with online networking throughout the rest of the year. These meetings are designed to learn from the best of the best, network with like-minded note investors, and learn new approaches and systems to improve our Note Business and bring optimal returns to our investors. Recently while attending the New Jersey Distressed Mortgage Expo, I was talking to a fellow Mastermind who suggested that I talk about some of the Mistakes I have learned to avoid from my fellow Mastermind members. So, today’s talk is dedicated to talking about some of the mistakes I have learned to avoid in the due diligence process from the Mastermind group. Not making sure the property has a clean title. The tapes we typically receive are typically in Microsoft Excel. When we receive a tape, it contains a lot of information broken out in columns. Items such as the borrower’s current interest rate, unpaid balance, last paid date, taxes owed, property address and the banks broker price opinion or BPO are a part of the tape. Now, one could take all of this information as 100% accurate, but that will get you in trouble very quickly in the Notes business. We trust but verify the information by going through our own additional detailed due diligence process to verify the accuracy of the information on the tape. One of the key pieces of information typically found on a tape is the outstanding taxes. You can verify the taxes by going to the county’s tax website or by contacting the county where the property is located. If you don’t double check and research the taxes, you might find yourself in a situation where the property has already gone to tax sale for unpaid taxes. Now, if the property has already been sold at tax sale, you will want to find out have much time you have left in the process. Just because taxes are due doesn’t mean you necessarily want to avoid the property, you just need to know how you will deal with the taxes owed. You may want to lower your bid for an asset to help offset the taxes. You definitely want to make sure you know as much about the tax situation before purchasing the asset. 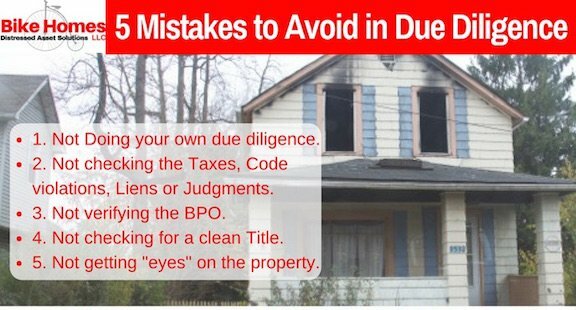 Another mistake I learned to avoid is issues from not checking for code violations, liens or judgments against the property. If you purchase a property with code violations, you will have to correct the property’s violations or worse pay additional fines you didn’t know about. Same goes for liens and judgments; these have to be cleared up before you can resell the property. Again, to verify code violations, you can contact the county where the property is located. Most tapes include some type of BPO. Again, we trust but verify the information. You want to contact a local realtor to pull comparables and provide Broker Price Opinion for all of the properties you are potentially going to buy. If your BPO is different than the tape, you need to work with the seller to communicate the differences with information and facts to back up your differences which could potentially lower your bid on the asset. You want to make sure the property has a clean title to avoid the extra time and legal expense to clear up title issues. One company we use is Pro Title USA to pull an Ownership and Encumbrance Report (O&E) which typically takes 48 hours. The O&E report also sometimes referred to as Current Owner report, identifies the last recorded owner of the property, a legal description of the property and any open liens, mortgages, or judgments. Pro Title provides this in a summary page and also includes bankruptcy information. You want to make sure that the name on the mortgage is the same as the one on the title. If a property doesn’t have a clean title, it will cost you time and money to go through and do the work to correct the title issues. Finally, you need to get “eyes” on the property. Now that doesn’t necessarily mean you have to drive or fly to see every property yourself. As part of the due diligence process, we research the property on various sites such as Redfin, Trulia, or Zillow to get as many pictures and information about the property as possible. In addition, Trulia also provides crime statistics, schools, and other public information for a property address. These sites also list comparison pricing for nearby housing to aid you in determining your own value for a property. Stacey has actually gone on road trips to visit properties for himself, but sometimes that isn’t possible or practical, so you want to contact a local realtor and have them drive by and take pictures for you or hire a company such as We Go Look to drive by and take as many pictures as possible. One thing we learned when Stacey made his rode trip to Ohio was that the online pictures are sometimes several years old. Be sure to check out our other Table Talks on the road trip. One of the properties we were going to purchase was actually burned out and boarded up while the pictures online showed a nice, clean, property. So this is a critical step in the due diligence process that could save you from potentially purchasing a potentially bad asset. So why does due diligence matter anyway? Well, we want to purchase the best assets for our own and our investor’s portfolios, so the more thorough due diligence we do before purchasing an asset, the better returns we can provide for our investors. Case in point, the asset in Ohio that was burned out when Stacey put eyes on the property; had we not done our own thorough due diligence, we would have potentially purchased a property that looked great online, had a great bank BPO but would not have been profitable to our investors. We would never offer an investment to our JV partners that we wouldn’t want to take on 100% for ourselves. Next time you are considering purchasing distressed non-performing notes, I hope you keep in mind the 5 mistakes to avoid that I have learned from my Mastermind group. Contact us if you would like more information on our due diligence process or becoming a Joint Venture Partner with us. Did you know you could lose your house if you don’t pay your water bill? Bike Homes Attends Mastermind in Austin, Tx – What is a Mastermind? Baseball & Notes??? What do they have in Common?